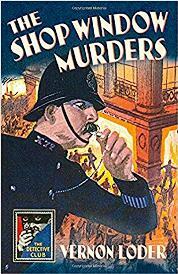 For a crime novel published in 1930 The Shop Window Murders offers some fascinating similarities to the present day. As the shop windows are those of a giant London department store, very similar to one recently recreated on TV, envisaging the crime scene should be no problem; and as the owner of said store was not the provider of the funds that bought it, there’ll be another modern echo; and, finally, as one motive for murder is a dispute over the creation and patents of a best-seller, there’ll be yet another bell ringing for readers who stop and look about themselves. Nigel Moss provides a fascinating introduction to the book, but two of those points above are, I think, not mentioned. That’s probably because there is so much within this one work. As Moss says it is intricately plotted with many false leads, cover-ups, and crimes within crimes with similarities to works by John Dickson Carr and Ellery Queen in the murder method. The combination of crime and grotesquerie is also worth mentioning as the blinds are drawn back one morning from the window display of the great department store to reveal two corpses. One is Manders, the nominal owner of the store, and the other is an employee, later discovered to be – if not his mistress then – his intended mistress. As police forensics go to work it becomes clear that neither was killed in situ, though the location of the real killings takes some research, as it is discovered that not only were the pair not killed in their final resting place, but did not die together either. I wonder if “red herrings and different angles”, as Nigel Moss calls them, is a phrase designed to help the reader think more widely about the solution. There are unhappy family members, embittered lovers, a blackmailer, various ex-servicemen who may have brought back weapons from France, struggling inventors on one side, and a functional police force with access to forensics on the other. All will have their part to play but the solution – guessed at by Inspector Devenish but only confirmed by a confession – fits the period exactly, and also looks forward to Raymond Chandler’s proposed ending for The Blue Dahlia (1946) fifteen years later and written after another World War. It makes The Shop Window Murders, which is both a golden age crime novel and a novel of abnormal psychology, well worth re-printing today.